By Dale Johnson Posted: July 24, 2017 6:00 a.m. These hot summer days may prompt you to cut back on outdoor activity – just as cold weather during the winter can be a reason to sit on your sofa. 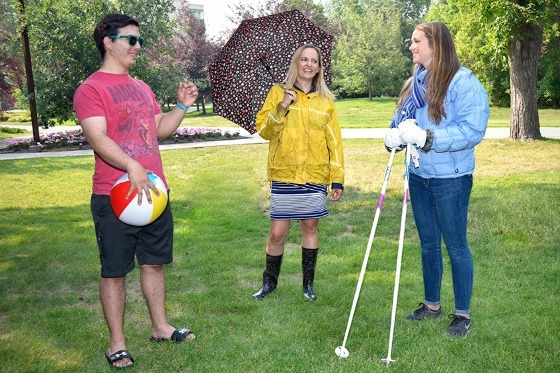 A research team at the University of Regina, led by Dr. Katya Herman, Assistant Professor in the Faculty of Kinesiology and Health Studies, is looking into how the seasons affect physical activity. Herman says in Saskatchewan there is a higher-than-average obesity prevalence compared to other Canadian provinces. “One hypothesis is that the temperature extremes, especially the cold winters, may influence physical activity levels. Specifically, the more variable climate may be more likely to produce inconsistent physical activity patterns, compared to more moderate climates such as in British Columbia,” she says. But she says more research needs to be done. Now she’s looking into variations during the year within the same individuals in her three-year research project called SeasonActiv. Funding has been provided by the Saskatchewan Health Research Foundation. “This is in order to compare people who are more consistent in their activity levels to those who are more inconsistent. This also applies within the week, looking at ‘weekend-warriors’ compared to people who do a little bit of activity each day. While we may assume it is healthier to be active every day all year long, we don't currently have evidence to decipher the importance of consistency vs total volume of activity. If people have the same total amount of physical activity – be that high or low – are health outcomes impacted by patterns over the year, or is it just the total volume that matters?” Herman explains. The research team is looking for about 50 more participants for SeasonActiv. Healthy adults from the ages of 20 to 65 who are not on any cholesterol, blood pressure, or diabetes medications can sign up to come in for four morning assessments, lasting 60 to 90 minutes each, over four consecutive seasons. “At each assessment, we measure height, weight, body composition, blood pressure, grip strength, and do a simple finger prick blood test to measure cholesterol and glucose levels. Participants also complete a questionnaire, and then leave with a small device that they wear on an elastic belt on their waist for the next seven-days to measure their usual physical activity. Participants receive their personal health results, a free one-day pass to the U of R Fitness Centre, chances to win draw prizes along the way, and entry into a final grand prize draw that the end of the overall study for those who completed all four of their assessments with us,” Herman says. She says it would be beneficial for the research project if more men participated because so far about 70 per cent of participants have been women. “It is important for men to participate so that we can look for male-female differences in activity patterns, as we know there are differences in health outcomes and the development of heart disease and other chronic diseases,” explains Herman. She says that so far response has been great with about 150 people enrolled in SeasonActiv, of whom about 50 have already completed their four visits. “Participants are always ‘thanking’ us for the opportunity and really expressing how positive an experience it was for them. Our research team has met so many wonderful people, and we really get to know them over the course of four seasons, so overall it’s been a truly fun experience from the research side,” Herman says. Anyone interested in participating can get more information here, and make contact through the website, or at season.activ@uregina.ca, or phone the Physical Activity Epidemiology Lab at 306-337-3140.